Ecological destruction and environmental degradation are merely symptoms of a more profound structural economic problem endemic to industrialization and consumerism. As can readily be observed, these are systems based on a flawed operational and ideological premise that believes it can “generate profit” by consuming its capital — the most important being nature itself. Ostensibly, fossil fuel-based industrial capitalism has sought to replace nature’s “autotrophic infrastructure” as the functional basis of human civilization’s economic systems. I’ve written previously about how problematic this conceptual model is given what has resulted from its practical implementation. Industrial civilization has essentially constructed a poorly designed and executed copy of nature which first requires its removal and subsequent cannibalization to build industrial infrastructure. This is further compromised by an inherent conflict-of-interest and moral hazard because the components created to construct this industrial, mechanized facsimile of nature are spawned from ideas which are legally owned by someone — the use of which must be licensed and paid for. This makes an objective critique of such an arrangement highly unlikely and virtually impossible since there is a vested interest in overlooking any flaws that may arise. These flaws are called, in the technical jargon of economics, ‘externalities’. … Of the top 20 region-sectors ranked by environmental impacts, none would be profitable if environmental costs were fully integrated. Ponder that for a moment: None of the world’s top industrial sectors would be profitable if they were paying their full freight. Zero. I’m not sure if the problem here is necessarily capitalism in and of itself as opposed to the variant currently in use. Industrial communism is just as guilty as the capitalist version of destroying nature, so there isn’t much separating these two economic systems in that regard (according to the late Russell Means, communism has created more destruction in a shorter period of time). The common problem, more accurately, seems to be industrialism/industrialization. Part of the current problem is that the discussion about making industrialization more ’sustainable’ (i.e. – less destructive) seems to be a bit of an attempt to delude ourselves. It’s a bit like deciding what calibre of bullet to switch to in shooting yourself in the foot in an attempt to reduce the damage done. Will it drop from a .45 calibre down to a .38 or a .357? The problem is that you are still shooting yourself in the foot. Congratulating yourself for changing to a smaller bullet shouldn’t be much consolation. It’s still going to hurt. Making a ‘less destructive’ version of industrial capitalism is much the same. But the question we should be asking is whether or not we have to shoot ourselves in the foot to begin with. The human brain has enabled mankind to discover and create wondrous things; it has also been used to inflict horrendous suffering and destruction. In fact, it would be difficult to design an economic system more destructive, wasteful, and dehumanizing than the industrial, and much of the destruction it has wrought may be irreparable. Industrialization does not efficiently allocate resources; it squanders them. To summarize, locally grown food contains the least embodied energy — with the system being fuelled primarily by ‘real-time’ sunlight. The source of energy that is currently relied upon is fossil fuel based energy in the form of “fossilized sunlight” (which is effectively “cheated or stolen” time), converted into useful work through machines. Modern industrial civilization — and the infrastructure and institutions comprising it — would not exist, and could not continue to exist as it does, without it. Contextualizing this against the genius of permaculture design, especially when related to energy, is useful in appreciating how it describes its central operational goal. In essence, it seeks to create arrangements facilitating the highest possible system functionality and yield for the lowest possible energy input required to produce and maintain it. This ultimately ensures that waste and misuse of any available resources needed to create these systems are minimized and/or eliminated. Virtually all of the problems associated with industrialization can be reduced down to its inability to properly account for obvious functional deficiencies and inefficiencies. Our highest calling as designers should be to help create opportunities for all things to do the work it was seemingly made to perform. At the very least, we should avoid becoming obstacles or hindrances to that pursuit. To that end, a skilled designer recognizes the unique strengths of each component employed and facilitates the best functional arrangement and assembly of these elements. Gaining clarity about these points is critical to making sense of the discussion to follow. There are two types of capitalism I’d like to examine here that I feel provide a vehicle to better understand the dilemma presented by our current economic thinking: rentier capitalism and natural capitalism. Comparing and contrasting these opposing visions may provide some useful insight. 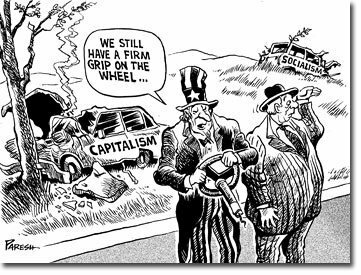 Rentier capitalism is a term used in Marxism and sociology which refers to a type of capitalism where a large amount of profit-income generated takes the form of property income, received as interest, intellectual property rights, rents, dividends, fees, or capital gains. The beneficiaries of rentier capitalism are a property-owning social class that, according to Marx, play no productive role in the economy per se, but who monopolize the access to physical or financial assets and technologies. They can make money not from producing goods or services themselves, but purely from their ownership of property or investments (which provide a claim to a revenue stream) and dealing in that property. Conversely, natural capitalism — a concept put forward by Paul Hawken, Amory Lovins and Hunter Lovins — describes the global economy as being dependent on natural resources and ecosystem services that nature provides. Natural capitalism recognizes the critical interdependency between the production and use of human-made capital and the maintenance and supply of natural capital. It argues that only through recognizing this essential relationship with the Earth’s valuable resources can businesses, and the people they support, continue to exist. While traditional industrial capitalism primarily recognizes the value of money and goods as capital, Natural Capitalism extends recognition to natural capital and human capital. Problems such as pollution and social injustice may then be seen as failures to properly account for capital, rather than as inherent failures of capitalism itself. The difference between these two economic concepts is similar to the separation between geocentrism and heliocentrism; one is effectively an ego-driven delusion and the other is the actual fact. In other words, we’re looking at Ideological Preference vs. Functional Reality. The rentier capitalist expects everything to revolve around the use of property – most notably, intellectual property and proprietary technology. The thinking behind the development of the genetically modified organism, for example, is a powerful metaphor for our time: born from an attempt to impose an order based on a misunderstanding of natural systems (resulting in an increased “engineered/designed” disorder), fuelled by business-related motives (revenue and profit generated via exclusive proprietary technology and intellectual property rights – the cornerstone of rentier capitalism), producing an inherent conflict-of-interest and moral hazard which ultimately begs the question – is the objective to solve a problem or to sell a product? These two possibilities are not automatically synonymous. Following the implied logic of rentier capitalism, there potentially exists a financial incentive in creating problems to manage (not necessarily solve) – because this would require the innovation of new products to perform that function. Given that virtually every aspect of the world we live in has become financialized and subject to speculation (agriculture is a good recent example), ‘innovation’ by extension becomes financialized and largely a vehicle for making money as opposed to effective problem solving. In rentier capitalism, innovation is ultimately about making money — not problem solving. To reward people simply for innovating — or to deem innovators as being worthy of attention without careful consideration of the system within which they are innovating — is without merit and may potentially be harmful, encouraging a misguided creative entrepreneurship. As stated, the entire endeavour is corrupted due to the financialization of ideas and its being subject to the vagaries of speculation. Problem solving may sometimes involve innovative product design, but it doesn’t necessarily require it. If we are led to believe that it does, this could prove to be a significant barrier in our ability as system designers to do our job in providing the best solutions to the challenges confronting us. Contrasting the fundamental philosophical basis of a system like rentier capitalism, when compared to natural capitalism, will lead to wildly different conclusions on how to best face the many crises looming on the horizon due to what is deemed worthy of being rewarded and praised. Great article. The dismantling of the fiscal-driven delusion that holds sway over much of socio-political life in our world seems to go hand-in-hand with the dissolution of the ego-centricism that Kent alludes to. A question I have is: how can we effectively precipitate and/or bring to the forefront the reality of crisis we face as a civilization so as to spark an analysis of the confines of our ego-consciousness while not playing into the fear-based proclivities of the monkey-mind?